Is China's mobile phone market deteriorating and Apple's revenue in China still growing? Recently, apple mobile phone business again spread some adverse news, Wall Street analysts further lowered the two quarter of mobile phone sales forecast value. In addition, TSMC's low expectations for annual performance are also considered to be directly related to the weakness of Apple mobile phones. In May 1st, Apple will release its first quarter (natural quarter) earnings. According to foreign media reports, as China's mobile phone market has seen a significant decline, so Apple's revenue in China can continue to grow, it will be worth noting. From Cook's visit to China many times, it is easy to see the position of the Chinese market in the apple territory. A few years ago, apple cellphones relied on big screens, sold huge sales in the Chinese market, and doubled their sales revenue, but with the rapid rise of Chinese domestic phones, apple sales fell sharply, or even up to 1/3. However, Apple has begun to get out of the bottom of China's business. With the appointment of ge yue as head of China's business, Apple's revenue in China has increased over the past two quarters. In the fourth quarter of last year, apple earned $18 billion in China's revenue, an increase of 83%, an increase of 11% over the same period last year. China accounts for 20% of the world's total revenue. However, according to MarketRealist and other foreign media analysis, China's smart phone market is going to be saturated and down, which will make Apple's operation more difficult. 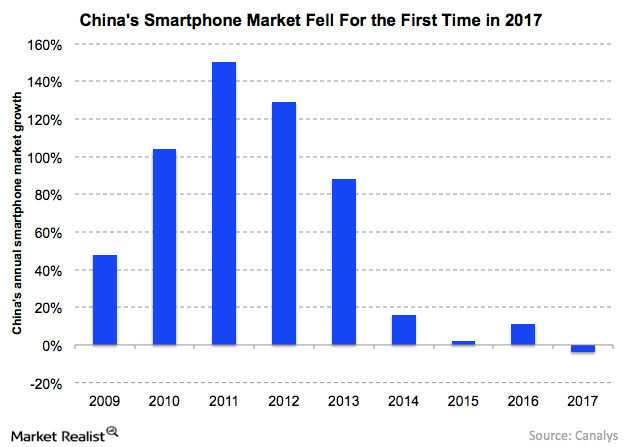 Over the past several quarters, China's mobile phone market has seen a year-on-year contraction. According to Canalys and other companies, China's smartphone market first appeared annual contraction in 2017, and in 2011, China's mobile phone market had a high growth of up to 150% in 2011. The foreign media pointed out that Apple put the Chinese market in a focus, but it would be hard for apple to maintain or increase its share of China's mobile phones in the face of a strong local mobile phone brand in China. Indications are that the shrinkage of China's mobile phone market is deteriorating. Last year, data from some agencies showed that China's mobile phone market fell by about 10%, but China's mobile phone market plunged 26.1% in the first quarter, and total cell phone sales fell to about 87000000, according to the China Institute of information and communications. Recently, a Chinese market research firm Sano announced the sales report of China's smartphone market in the first quarter. The report shows that Apple has sold 16 million 800 thousand mobile phones in China, ranking fourth in the industry, lagging behind HUAWEI, OPPO and vivo, but leading the company. In the first quarter of this year, apple mobile sales in China will grow or decline. Authority statistics show that the sales of Apple mobile phones fell in the fourth quarter of last year, but other products such as laptops promoted the year-on-year increase in revenue in China. Three mobile phones (including ten year special iPhone X), released last year by apple, were flat in the Chinese market, and there was a very rare phenomenon of rapid reduction in the price of external retailers. Recently, analysts at the Bank of Switzerland also said that because of the increasingly fierce competition in the mobile phone market in China, it is difficult for apple to return to its peak in its revenue in China. It is worth mentioning that in 2018, the full screen mobile phone has become a hot spot in the Chinese market. Many manufacturers launched a number of comprehensive screen models in March. Chinese manufacturers have more use of the better rectangular screen of the user's visual sense, the price is more reasonable, and still has a strong competitive price compared with the iPhone X.